Rome Prize winners live and work at the Academy’s eleven-acre campus in Rome and receive a stipend, room and board, and a study or studio. Stipends for six-month fellowships are $16,000 and stipends for eleven-month fellowships are $28,000. The deadline for applications is 1 November 2014 (extended deadline 15 November). 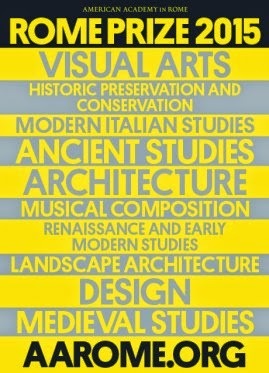 For more information and to apply, please visit the Academy website at www.aarome.org/romeprize.